To mark New Year’s Eve, young Buddhists flock to a temple in Bogor, West Java, not only to pray but also to sing, dance and act. In a kingdom, a queen lives in distress because she does not get the freedom she wants. She is forced to obey the king in all matters. He determines the way she should sit, stand and do other things. Dreaming to be a knight, she practices swordsmanship in secrecy. She never tells the king about this because she knows he would forbid it. One day when attending a sword-dueling tournament, she tells the king she wants to participate. He, however, forbids her. Fed up with various prohibitions he imposes on her, she defies him and signs up for the tournament without his permission. He is furious with her, but later shocked upon learning that she wins. The queen proves that the problem is the king’s mind-set, saying that a woman also deserves to be a knight. The story was delivered in a musical performance by a group named the Queen, with the vocalist singing American singer Barbra Streisand’s “Don’t Rain on My Parade” during the recent Indonesian 2018 Dream Festival (IDeFest) held in the compound of the Myogan-Ji Buddhist temple in Megamendung district in Bogor, West Java. After the Queen, a group called Firefighters staged a musical, with the vocalist singing British rock band Queen’s “Somebody to Love”. The musical revolves around a fireman who feels insecure after he realizes that he remains single because he is too busy saving people’s lives. Held by Majelis Nichiren Shoshu Buddha Dharma Indonesia from Dec. 24 to. 31, the festival featured 34 sports competitions – ranging from futsal and basketball to badminton – and 13 art competitions –including photography, culinary, band, dance, comedy theater and musical. During the show, IDeFest participants were cheered on not only by their family members and friends but also by residents of Megamendung. Lita, whose house is near the temple, said her son liked the group band competition so much that he recorded it using his smartphone. Lita did not watch it because she had to serve many IDeFest audience members who visited her food stall to buy roasted or boiled corn. During the festival, her neighbors also sold various food items, such as chicken satay, chicken congee and fried and boiled noodles in the compound of the Myogan-Ji temple. For the residents of Megamendung, IDeFest and Ready to Take a Challenge (REACH) summer camp are highly anticipated events. They are good opportunities to sell goods as the temple is more crowded then than on ordinary days. Themed “Men”, IDeFest was participated in by 700 youngsters from 24 provinces across the archipelago. Many of attended the REACH summer camp in the temple in July 2018. 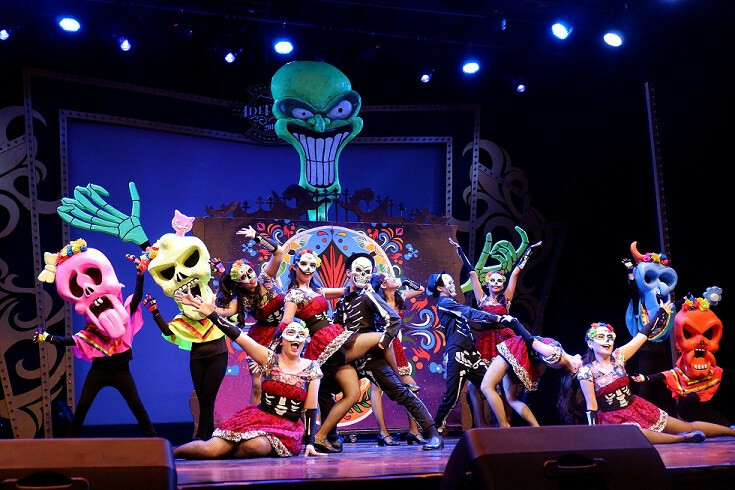 Unlike REACH, IDeFest offered cash prizes, such as Rp 8 million (US$552.79) for the winner of the dance competition and Rp 10 million in the musical. A pandita (priest) of Majelis Nichiren Shoshu Buddha Dharma Indonesia, Rusdy Rukmarata, said the festival was held at Myogan-Ji to attract young Buddhists to visit and pray at the temple. “We will pray together on New Year’s Eve. That is very important for us. We will start the coming year with a prayer to prepare mentality, in the hope that we can be better people in the future. If there was no event like this, they [youngsters] would not be interested in coming to the temple." Rusdy, who is also the artistic director and choreographer of the Eksotika Karmawibhangga Indonesia (EKI) Dance Company, was a member of a jury at IDeFest. Some of the other members were artistic director Iskandar K. Loedin, stage manager Dimas Leimena, dancer Josh Marcy and singers Nina Tamam and Sita Nursanti. Like TV talent shows, IDeFest also allowed the jurors to comment on the contestants’ performance. Cellgia group’s musical titled “Libido”, which tells of men who feel superior to women, failed to impress the jury because the vocalist did not fully understand the meaning of the song that she sang or live the role that she played. “It seems that you [the vocalist] are not comfortable with the blocking and the choreography,” said Sita, a member of Bandung-based vocal trio Rida Sita Dewi. The Irresistible Dope group’s musical titled “Boy’s Power”, which tells of a school gang fight, passed with flying colors. “Your voice is incredible. The overall performance was cool,” Dimas said. At the end, Rusdy said that IDeFest aimed to unlock and develop youngsters’ talents in the arts and sport.